What values does Ahmedabad represent in contemporary times? This is among the questions Saroop Dhruv’s Gujarati language 'Shahernama' covers by treading the path of the city’s heritage. In 1918, a year after the world witnessed the bloody battle between capital and labour guided by an internationalist communist vision in Russia, a similar clash – albeit a bloodless one – was playing out in the textile centre of the Indian subcontinent: Ahmedabad. Led by a feminist leader Anasuya Sarabhai – pitted against her own brother, Ambalal Sarabhai – and guided by Mahatma Gandhi, Ahmedabad saw a textile strike involving more than 15,000 weavers. The entire city came to a standstill since half of Ahmedabad’s population comprised of the working-class families concerned with textile whose plague bonus was attempted to be terminated. Gandhi, acting as a mediator on behalf of the workers, ultimately resolved the conflict through his first major fast unto death making use of the analogy of ‘parent-child’ to represent the relationship between capital and labour. This moment was a truth experimentation of Gandhi’s to consciously alter the principle tenets of organising Ahmedabad by preventing a class schism in the nationalist movement, buying the trust of capital and labour and establishing his authority in the city. What were those principles before Gandhi’s time in this textile hub? What values does Ahmedabad represent in contemporary times? These are some of the questions that Saroop Dhruv’s fresh, first-of-its-kind Gujarati language book on Ahmedabad titled Shahernama covers by treading the path of the city’s heritage. A fat book of 600 pages, Shahernama is incisive in weaving a narrative around people and places in the city bespeaking of Dhruv’s several decades long personal, academic and activist engagement with Ahmedabad. Shahernama takes its readers on a 12-day long heritage tour with an exceptionally sensitive and diverse group of curious participants. This review concerned with the treatment of Ahmedabad’s history in Shahernama wilfully neglects its characters while steadfastly following their conversations and interjections about the city’s socio-politico-economic history. Popular legend has it that Ahmed Shah I decided to found Ahmedabad, amazed after seeing the unusual sight of a hare chasing a dog on the banks of the Sabarmati river. He was convinced about the courage and boldness of the people of the land. Although, this clichéd myth, among many other such legends, features in Shahernama, Dhruv concentrates on the realpolitik of Ahmed Shah’s strategic decision to establish Ahmedabad in 1411 near the site of the erstwhile Karnavati and Ashaval. 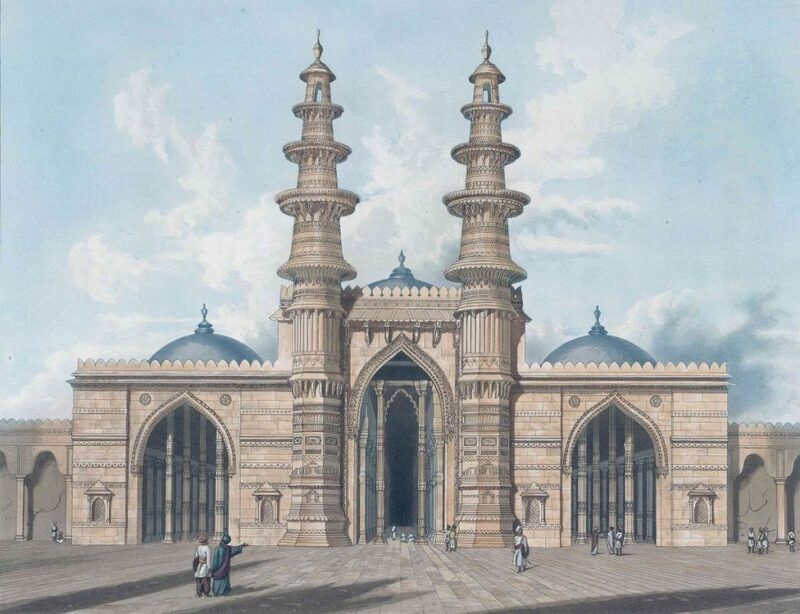 Closer to the seas, Ahmedabad had formal structures like the mahajans to facilitate trade evidencing the city’s business spirit – a driving factor for Ahmed Shah to shift the capital of Sultanate rule from Patan to Ahmedabad. The mahajan is a guild-like body, headed by a sheth, devised on occupational lines typically having a decisive role regarding wages, prices, working conditions, admission rules of merchants and artisans (whose body was labelled the panch). She takes us to one of the earliest signs of the entrepreneurial spirit of Ahmedabad that still survives at the now gentrified banks of Sabarmati river: the Gujari bazaar (local flea market) held every Sunday where one will find local vendors selling goods ranging from furniture and electronics to livestock. The Gujari’s association named after Ahmed Shah pays a fine tribute to the Sultan who attempted to devise a city respecting the logic of mercantile capitalism. The human geography of Ahmedabad depended on the mahajans. Residential societies in Ahmedabad called the pols containing a labyrinthine network of passages with a familiar but sometimes nosy sociability, reflected a few of these facets of mahajans as the pol‘s members had occupational/caste commonalities or a sheth’s patronage. Dhruv gives justice to the marvellous architecture which developed during the Sultanate rule with a certain Islamic touch to it including numerous public spaces such as the Jama mosque, the famous Sidi Sayed ki Jali, now gentrified Kankaria lake, Sarkhej Roza, Rani Sipri’s Mosque, Bhadra fort, to name a few. She makes no secret of her admiration of Ahmed Shah portraying the Sultan as a ‘just and disciplined’ ruler (pg. 89). This characterisation is fallacious. Achyut Yagnik and Suchitra Sheth in their influential book The Shaping of Modern Gujarat (Penguin, 2005) depict Ahmed Shah as ‘one of the most intolerant rulers of Gujarat’ adding that he was the first crowned head of Gujarat that ‘distinguished between its citizens along the lines of religion’. A religious orthodox to the core, Ahmed Shah not only imposed jiziya tax on non-Muslims but also laid the foundations to persecute the non-conformist Shia Bohras. Ahmed Shah’s descendants carried forward this lamentable legacy. In Shahernama, Dhruv introduces Mahmood Begda of the Sultanate dynasty, under whose rule Ahmedabad tremendously expanded, as a figure pursuing the dream of turning Gujarat into a ‘second Mecca’, but it is puzzling that she does not conjoin it with his religious fanaticism. When Ahmedabad was annexed by the Mughal empire, Akbar suspended the jiziya tax, beginning a process of interfaith harmony that lasted until the mid-17th century. The Mughal privileged the Jains and Vaishnavs who held the influential position of nagarsheth (head of the council of mahajans). Indeed, as Dhruv points out, Akbar toured the city to visit the Sufi Dargahs and promoted music and arts (pg. 203). However, Akbar’s son, Jahangir, had a ‘love-hate relationship’ with Ahmedabad which he called ‘Gardabaad’ and ‘Bimaristan’ (the Persian equivalent of a ‘hospital’), yet he chose not to disturb the social structure of Ahmedabad (pg. 206-207). Her description of Mughals is packed with oversights that are hard to ignore. For instance, she calls the Mughals ‘Shias’ while referring to a Shia-Sunni conflict in 1619-1620 (pg. 213-214); Mughals were Sunni Muslims following the Sufi traditions. Consequently, her reasoning that the Mughal empire lost its hold over Gujarat because of their ‘hatred towards Sunni Muslims’ becomes questionable (pg. 216). Shahernama claims that Aurangzeb introduced jiziya tax in Gujarat (pg. 216); he, in fact, only reinstated this discriminatory tax that existed under the Sultanate rule. Instability began in the later years of Aurangzeb’s reign as Marathas led by Shivaji began to loot Gujarat to finance their kingdom. In the early 18th century, a power-sharing formula regarding Ahmedabad was worked out between the Mughals and the Marathas. Soon, a diarchy rule of Peshwas and Gaekwads evolved which wreaked havoc on Ahmedabad promoting corruption in governance with unreasonable taxes and depriving the wealthy Nagarsheths of their status and privilege. People of Ahmedabad pejoratively referred to the Marathas as ganim, meaning a raider. Shahernama mentions that the Marathas were particularly prejudiced against the Muslims destroying their cultural heritage and compelling many Muslims (especially the rich ones) to leave the city (pg. 225). Shahernama charts out a usual and well-accepted narrative about the British rule in Ahmedabad. The city was in great ruins when the British flag flew over it in 1818 marking the end of Maratha rule. The British were welcomed in Ahmedabad since they patronised the Nagarsheths, like the Mughals, leading to a much-needed period of peace. The emphasis on science and technology, education, women rights, the abolition of superstitions by the British found immediate support among the local elites: In some sense, the British began a ‘secular’ phase in Ahmedabad’s history although Dhruv equates it with the ‘Renaissance’ (pg. 290). Ahmedabad elites’ collaboration with the British administrators was a quid pro quo of sorts. Dhruv cites a little-known gem: Dayananda Saraswati, the founder of the Arya Samaj, had urged the mahajans of Ahmedabad at the time of the 1857 revolt to fund the Indian cause but the mahajans did not agree to his demand (pg. 308). Indeed, during the revolt of 1857, the Ahmedabad elites supported the British Empire. The influential mahajans wanted stability for their business to flourish and little interference in city’s affairs while the British administration wanted the absence of nationalist passions to cement their political power. Shahernama alerts its readers to the fascination of mahajans with the Western ethos and the English language. Bholanath Sarabhai and Kavi Dalpatram Travadi were the first ones to associate with the British. Dalpatram, a key figure in the city’s history and also in Shahernama, became a close friend of the colonial officer, Alexander Forbes; both of them promoted the cause of Gujarati intellectuals by forming the Gujarat Vernacular Society in 1848 which became a place to deliberate on social issues through its monthly magazine Buddhi Prakash (literally, the spread of light/knowledge). Progressive reformers like Ranchhodlal Chhotalal, founder of Ahmedabad’s first textile mill and Ramanbhai Nilkanth, the second mayor of Ahmedabad and a respected literary figure, dominated the scene of Ahmedabad. Dhruv carefully demonstrates the dualism of reform – although caste rules became somewhat relaxed and women education was promoted during the British rule, there were no radical measures which could undermine the authority of the mahajans. The reformers were more focused on building hospitals, schools, improving the urban infrastructure and less so in promoting the cause of egalitarianism. She cites the case of Stree Bodh and Sundari Subodh – two magazines standing up for women empowerment – which had a ‘patriarchal tone’ to their writings (pg. 306). Institutes like All India Women Council, established in 1888 in Ahmedabad, and several ladies’ clubs restricted their attention to elite and urban middle-class concerns (pg. 327). 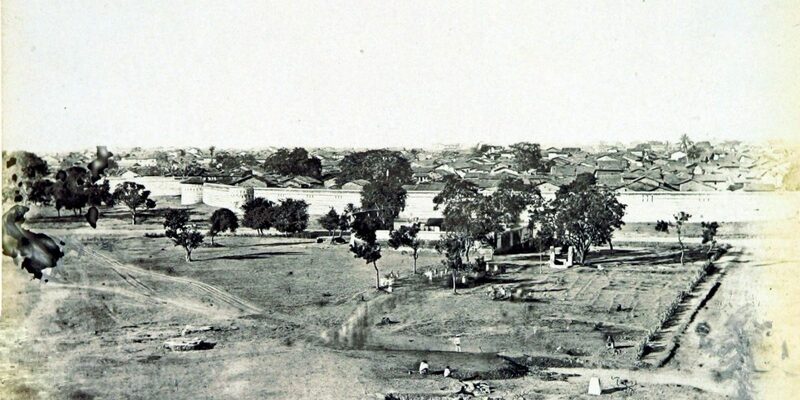 By design, Ahmedabad was a place of limited emancipation. The story of Ahmedabad under the British, who were obsessed with the creation of statistics through census, surveys and reports, is detailed out in Shahernama with minuscule use of statistical evidence or hearsay, unsubstantiated figures. For example, Shahernama wrongly exaggerates that the city had a hundred textile mills by 1871 while, in reality, there were 27 textile mills employing 15,000 workers by the end of the 19th century (pg. 362). Dhruv is erroneous in claiming that the Indian railways began in 1863 between Bombay and Baroda as the first train in India was between Bombay and Thane in 1853 (pg. 337). The population of Ahmedabad grew concomitant with its wealth: By 1901, nearly 1,86,000 people resided in Ahmedabad – a jump of over 35% compared with the 1872 Census figures. Ellis Bridge, the first bridge in Ahmedabad over the Sabarmati river, constructed in 1892, enabled the movement of elites outside the walled boundaries of the congested eastern side to the then still infant western Ahmedabad localities such as Paldi and Navrangpura. Dhruv rightly asserts that the local elites initiated reforms ‘from the top’ pre-empting a mass movement that would threaten the existence of the British Raj but she does not muse over the context of the nationalist struggle. Industrialisation in Ahmedabad gave rhetorical impetus to nationalism rather than providing any real momentum. The defiance by industrialists was only economical to prevent foreign enterprises to set foot in Ahmedabad without an overtly political tone. Hence, despite events like the Congress annual session in 1902 in the city or the throwing of two bombs at Lord and Lady Minto in 1909, nationalism grew tepidly in Ahmedabad. The arrival of Mahatma Gandhi in Ahmedabad turned this setting upside down. ‘My eyes had come to rest on Ahmedabad’, Gandhi writes, in his memoirs documenting his experiments with truth. The original version of the autobiography translated from Gujarati to English by Gandhi’s trusted confidante, Mahadev Desai (now updated by Tridip Suhrud), mentioned that Gandhi had a ‘predilection’ for the city. Gandhi attributed his decision to settle in Ahmedabad after leaving South Africa for good in 1914-15 to his cultural affinity with Gujarat and the Gujarati language (his influential text on Indian freedom struggle, Hind Swaraj was first written in Gujarati). The city was ‘an ancient centre of handloom weaving’ with a healthy culture of philanthropy that resonated well with Gandhi’s concept of trusteeship and made him confident to set his base in Ahmedabad. Dhruv opines that Ahmedabad’s ‘moderate/middle-way’ of dealing with industrialisation, unlike, a rapidly modernising city such as Bombay, attracted Gandhi (pg. 365). It was easier for Gandhi to spread his message of communal harmony from a city that was developed on religious values of the local elites – Jains, Vaishnavs and Muslims – and had a history of few religious conflicts back then (pg. 365). Gandhi’s initial years are lucidly outlined in Shahernama. He nurtured lifelong associations in the city and set up the Kochrab Ashram in the then expanding western Ahmedabad on a bungalow gifted by his friend Jivanlal Desai. These tasks went simultaneously with his goal of turning the Indian freedom struggle into a mass movement from being limited to an urban debating society. A plague in 1916-17 forced Gandhi to establish another, bigger space called the Sabarmati ashram, few miles away from Kochrab ashram, in the same, western side of the city; his primary motive at this ashram was to carry out farming and husbandry activities (pg. 368). His decision to welcome untouchables at the Sabarmati ashram dried up financial support from the wealthy until a mill owner, Ambalal Sarabhai, saved him by handing Rs 13,000 – a famous incident which Shahernama mentions (although Leena Mangaldas, Ambalal Sarabhai’s daughter, has raised doubts about this claim in her Gujarati autobiography Akhand Divo.) A year later, Gandhi did not hesitate to represent workers in a strike against the mill owners led by Ambalal Sarabhai. The 1918 strike allowed Gandhi to accumulate his power in the city. Workers gathered in thousands to ‘watch the little man in the loincloth speak’ as the celebrated psychoanalyst Erik Erikson writes in his book Gandhi’s Truth. However, Dhruv sees the 1918 textile strike with some suspicion frequently invoking the term ‘Samadhanwadi’ (believing in mediation) for Gandhi. She asserts that Gandhi’s mediation techniques with regards to class conflicts stymied the growth of the Left on the political scene of Gujarat. By the late 1910s, Ahmedabad was properly steeped in the ethics of Gandhian thoughts. New institutions in the city that Gandhi built to instil nationalism and spread the vision of ‘Swadeshi’, all of which are detailed in Shahernama confirm his dominance over Ahmedabad: Navjivan Trust (responsible for publishing ‘Young India’ beginning 1919), Majoor Mahajan (Textile Labour Association), Gujarat Vidyapith (a university set up in 1920). Gandhi had replaced the old guard of Ahmedabad with a new leadership, as Howard Spodek writes in his book Ahmedabad: Shock City of Twentieth-Century India (Orient BlackSwan, 2012), comprising Vallabhbhai Patel, a socialist Indulal Yagnik, Anasuya Sarabhai (a labour leader) and two leading textile industrialists of the time, Ambalal Sarabhai and Kasturbhai Lalbhai. In some sense, Ahmedabad became a city of firsts for Gandhi: his first Ashram in India, his first fast unto death in 1918 and the first major case against him accusing of sedition in 1922 under the much-criticised Article 124(a) of Indian Penal Code. Gandhi’s historic 1922 trial resembles the trial of Socrates who willingly drank the poisonous hemlock as a punishment for promoting critical thinking. In the same way, the bona fide dissenter in Gandhi did not hesitate to plead guilty proclaiming sedition against and defiance of the British administration as ‘the highest duty of a citizen’. 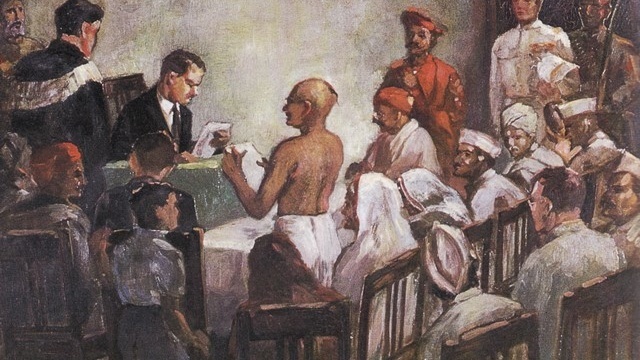 It is unclear why Dhruv does not explicate this memorable conversation between the Indian nationalists and the colonial power although the book has a passing reference to the well-known sketch of Gandhi’s trial in the Circuit House in Ahmedabad by the painter Ravishankar Raval (pg. 495). 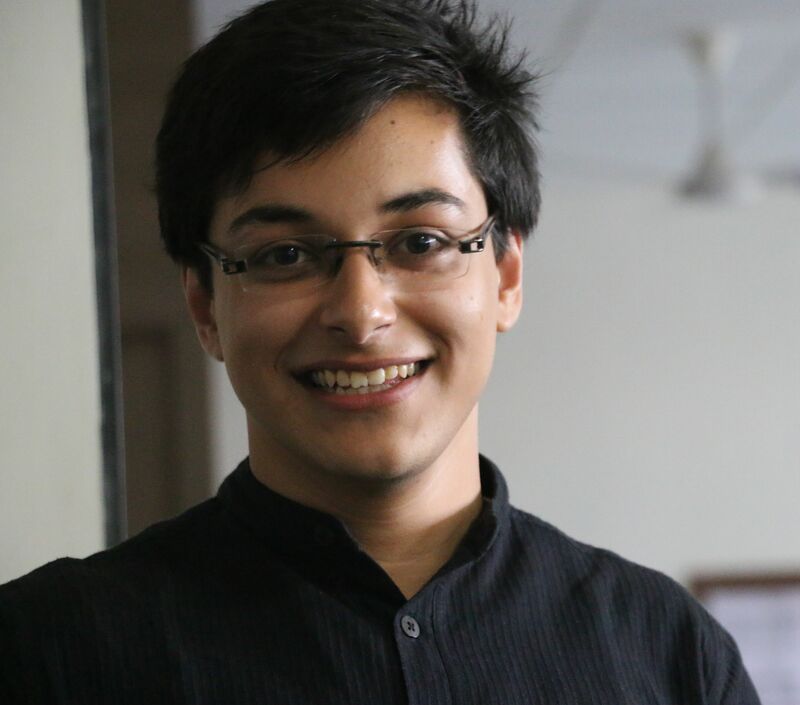 Dhruv aptly criticises many of Gandhi’s initiatives for failing to be sufficiently progressive. Until the late 1920s, Gandhi did not believe in dismantling the caste system (sans untouchability). She accuses the Gandhians of developing soft Hinduisation in their socio-cultural experiments (pg. 408). In fact, Gujarat Congress had conservative leaders like Vallabhbhai Patel, K. M.Munshi and Morarji Desai. Shahernama gives the example of B.R. Ambedkar’s visit to Ahmedabad in 1931 who was vehemently opposed and shown black flags including by the Dalits (although Dhruv’s reference to Ambedkar being garlanded with sandals is an obvious untruth). If Ambedkar was opposed, V.D. Savarkar, who coined the term ‘Hindutva’, was welcomed and spoke in favour of separate nationhood in 1937 in Ahmedabad. Gandhi, though he gave space to women in the nationalist movement, advocated a glass ceiling for women. Shahernama cites incidents of Gandhi advising women to stay at home instead of working at the mills (pg 427) – a patriarchal position that even Majoor Mahajan’s newspaper Majoor Sandesh took supported by Anasuya Sarabhai who was schooled in labour welfare at the London School of Economics (LSE). After Gandhi left the city in 1930, the leadership that he had gathered continued to influence the city through various institutions including their positions in the municipality. But the Dalits and Muslims were conspicuous by their absence in this leadership which till date mars the public image of Gandhians. The Ahmedabad elite remained faithful to the nationalist struggle unlike the leftists whom Jawaharlal Nehru, the then president of the Congress party, at a worker’s meeting in 1937 in Ahmedabad, sternly warned while advocating to ‘smash’ the ‘Red Flag’ if it was ‘pitched against the tri-colour flag’. In 1942, when the communists were supporting the British Empire in World War II, one of Gandhi’s trusted associate and a mill-owner, Kasturbhai Lalbhai, in an unusual move backed the Majoor Mahajan when it declared a strike to extend its support to the Quit India Movement. There are various misrepresentations in Shahernama while the author’s assertions are weakened by the relative non-exploitation of the vast universe of quantitative data – the book would have greatly benefitted from the services of an able copy editor to fact-check a few details. For example, the Congress session in Ahmedabad was held in December 1921 and not in 1920 (pg. 381); Gujarat Vidyapith was established in 1920 and not in 1922 (pg. 382); Anasuya Sarabhai did not complete a degree course at the LSE (pg. 413). Dhruv calls the 1918 strike as ‘the first strike of textile business’ which is untrue since Ahmedabad itself had seen strikes in 1895 and 1899 in the textile sector (pg. 411). By the time Gandhi had left Ahmedabad in 1930, the city had grown to have a population of more than three lakh people. This number kept on increasing and reached close to six lakhs by 1941. The middle-class kept on emptying the old city to reside in the western side in the first half of the 20th century as more bridges across the Sabarmati accelerated this intra-city migration. Industrialisation reached its peak with the war-time expansion that brought more wealth to the industrialists without substantial percolation to the workers. Dhruv pays little attention to the wide prevalence of poverty among the working class which lived in proximity of the mills – close to 80 thousand workers were employed in 75 textile mills of Ahmedabad at the time of independence. At the cusp of independence, Ahmedabad was an industrial city par excellence – barring the awful living conditions in working-class chawls – ready to jump into the future driven by a traditionalist social structure but spirited enough to adopt the wisdom of science and technology. Sharik Laliwala, an alumnus of King’s College London and Ahmedabad University, is an independent researcher on the politics and history of Gujarat. He tweets @sharik19.